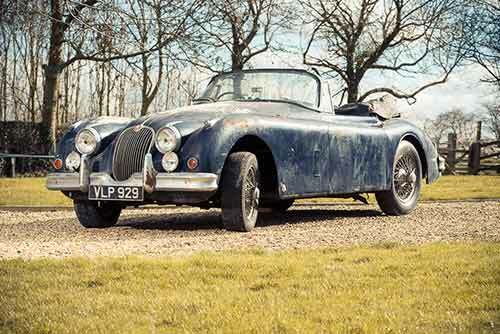 Two 1958 Jaguar XK150 barn finds, both estimated at between £35,000 to £45,000, are set to excite bidders at the very first Restoration Show Sale, hosted by Silverstone Auctions on April 12th at the NEC, Birmingham. The cars, an Indigo blue Drophead coupe and a Carmen red Fixedhead coupe, both have fascinating histories having been bought brand new by their respective owners in 1958. The Drophead coupe, VLP929, is the 74th example of the 622 right hand drive cars built. In the 1980s the car was bought by an Italian collector and exported to Sicily where it was discovered a short while ago alongside a treasure trove of other British sports cars. It was repatriated back to the UK where the enthusiastic vendor had the intention of restoring it to its former glory. With other priorities taking precedence the car is now offered for auction. The Fixedhead coupe, offered at auction for the first time, arguably has an even more interesting past. Hidden from the world since 1969, the car was discovered by an enthusiast in 2009, having spent forty years in a barn. Its first owner was a West Bromwich garage owner and renowned racing driver of the period, Alan Eccles. Fittingly for a racing driver, the car was specially ordered with an ultra rare close-ratio gearbox. After taking a job abroad in 1969, Eccles stored the car in the barn at his Shropshire home. Thinking this arrangement would only last for a few years, the car was eventually tucked away for the next 40 years, before being sold on. 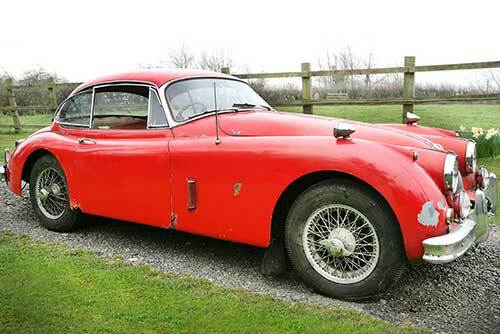 Both of these exciting project cars requires a full restoration and would provide an excellent base for any enthusiast looking for a fine 1950s British sports car. For more information on the sale please visit the Silverstone Auctions website.